Started in 2013, Glen Allen Grounds Management was formed to bring a different approach to the green industry. Will Lane and Eric Ellington set out to build a business based on integrity, loyalty, and customer communication. Homeowners and businesses have many options when it comes to selecting a landscaping contractor, and un-returned emails, phone calls, or even text messages can result in bad relationships, customer dissatisfaction, or even a loss client. One of our main goals is to be proactive vs. reactive when it comes to identifying problems and determining solutions with our properties, then relaying that to our customers as quickly as possible. Glen Allen Grounds currently employs 18 full time employees making up our landscaping, hardscaping, and grounds management teams. With over 75 years of combined green industry experience, Glen Allen Grounds has the knowledge and capability to handle anything your property can throw at us. Our foreman pride themselves on communicating with our clients to ensure their project or maintenance visit is being performed at the highest level, making sure they are satisfied with the results from start to finish. A Class A Contractor and SWaM member, Glen Allen Grounds has the capability and tools to complete almost any project at your home or business. We are also members of the Better Business Bureau, Angie’s List, & Houzz. We greatly appreciate our loyal customers who have allowed us to build a business in hopes of becoming one of the leading service providers in the Richmond green industry. Contact Glen Allen Grounds today to see how we may be of service to you! Will Lane’s landscaping career began at an early age of nine years old. He maintained a couple of properties in his neighborhood as a means to earn a little bit of income and develop a strong work ethic. After graduating from Deep Run High School, Will attended Longwood University where he would obtain his Bachelors degree in Business Management. He was also a member of Leaders By Choice, which was the group that assembled to re-charter Pi Kappa Phi’s Longwood University chapter in March, 2011. During the Summer of his college years, he worked for another local company where he took great interest in familiarizing himself with lawn maintenance, irrigation installation and maintenance, hardscaping, water gardens, and other common landscaping tasks such as mulching, leaf removal, etc. 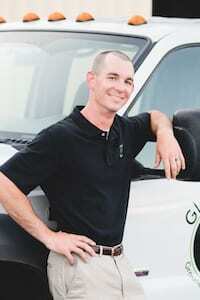 Will holds a Class B contractors license as well as an Irrigation Service Contractor license. Will lives in the West End of Henrico with his wife, Allie, and his Boxer named Gunther. In his spare time, Will enjoys hanging out with friends, watching football (Go Skins! ), fishing, and playing sports. Eric Ellington started in the landscaping industry in high school, where he obtained a few customers to manage after school and on the weekends. This venture grew into a small business before heading off to Radford University in 2007. 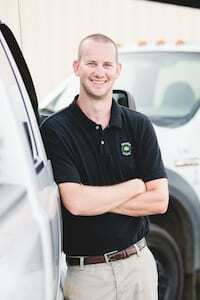 While receiving his Bachelor’s in Business Administration, he was able to continue his passion for the field by working for a local landscaping company. He gained knowledge in many aspects, including landscape construction and hardscapes. Throughout Eric’s employment history, he discovered many ways he felt he could bring better value into his customer’s outdoor living lifestyle. Eric is a NCMA Segmental Retaining Wall certified installer, and an ICPI certified installer in Richmond, Virginia. Eric lives in the Regency area with his wife Tiffany. He enjoys hanging out with his friends, spending time at the beach, and being in Lane Stadium on Saturday’s in the Fall to watch the Hokies. After graduating from New Kent High School, Savannah Young started her journey in the landscaping industry in 2017. She was an office assistant to a turf farm, where she gained knowledge and confidence in and out the office. She is thrilled to bring this experience and knowledgement to Glen Allen Grounds Mangement, LLC. Savannah lives in Providence Forge with her boyfriend, 2 dogs, and a cat. She loves living in the country spending time with friends and family.